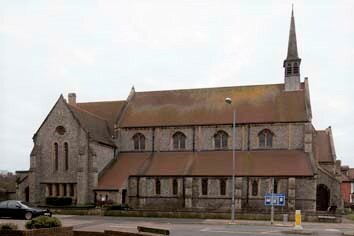 St Barnabas was the first church in the newly developed Bexhill-on-Sea and was opened in a temporary building in 1887. Within four years this had been replaced by a permanent one, built in 1891. This is spacious and built of flint by one of the most respected and prolific architects of the day,Sir A W Blomfield (CDG 185 p84). Instead of a tower, it has a slender wooden belfry above the long west windows that were one of his favourite devices. The chancel has a large traceried east window. The interior is mostly brick, including the piers of the low arcades and parts of the arches. The chancel arch is tall and the roofs show the high quality of carpentry that was a feature of Blomfield’s churches. As planned, the church had narrow aisles, but Blomfield’s son and successor, C J Blomfield rebuilt the south aisle in 1908-09 (ibid). It is gabled and as wide as the nave with more elaborate tracery in the west window. It stands clear of the first church, with a passage on the site of the original aisle terminating in the western entrance. The western part is partitioned off, originally as a baptistery, now a chapel of rest. C J Blomfield re-used the west window of the former aisle as the east window of the apse (BAL MSS/DB/6/1/1). In 1935 L T Moore remodelled and refitted the chancel (CDG July 1935 p287). According to one seemingly well-placed account, it was he who added the eastern apse in 1939 (T Ellis in Brandwood p211) and, indeed, Pevsner attributed the whole south aisle to him. However, set against this is the unequivocal statement in the VCH (9 p123) that the apse dates from 1909. This is credible, first because the entries in the VCH about Bexhill churches were largely compiled by two local experts, J E Ray and W E Meads and, secondly, because of the plausible date of 1922 for the painted ceiling of the apse (see below), which would rule out any later date. Further evidence in favour of the earlier date is the well attested fact (see the previous paragraph) that least one of the windows of the apse is reset from the south aisle of 1891 and it is unlikely that it would have been kept in store for 30 years after 1909. In 2005 there was severe damage by arson, especially to the roof; the north west corner was worst affected (ET 36 (June 2006) p91). 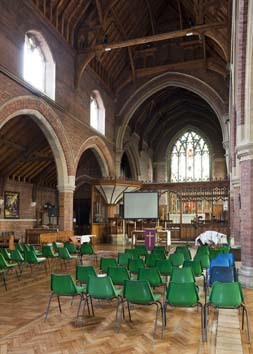 Worship was for a while confined to the south aisle and the diocese was reported to be considering demolition and redevelopment of the site, to include a smaller place of worship (CT 19 June 2009). 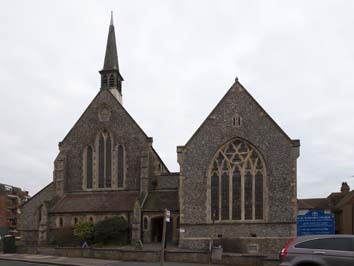 However, local resistance was strong and in 2010 the parish was able to reinstate the building, which remains in use (Church website). Font: Octagonal C15 style, with traceried sides on the bowl. 1. (West porch) Faith, Hope and Charity by Heaton, Butler and Bayne, 1895 (www.stainedglassrecords.org, retrieved on 28/1/2013). 2. (Lady Chapel) Heaton, Butler and Bayne, 1911 (CDG 1911 p207). 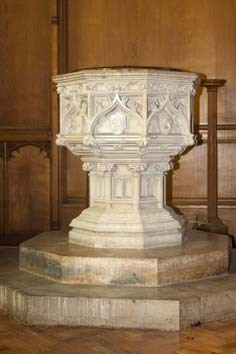 Some was destroyed in World War II (Church website), but the authorship of much post-war replacement glass has not been recorded. 3. 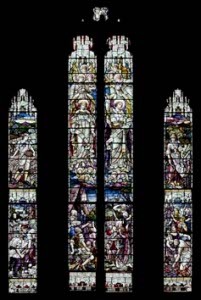 (East window) Heaton, Butler and Bayne, 1918 (ibid, retrieved on 28/1/2013). 4. 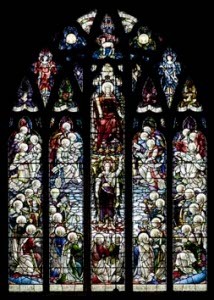 (West window) Heaton, Butler and Bayne, 1919 (DSGW 1939). 5. (North aisle) Five figures of saints, Heaton, Butler and Bayne, 1907-27 (www.stainedglassrecords.org, retrieved on 28/1/2013). 6. 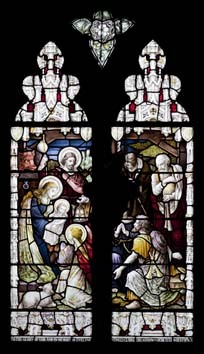 (South aisle, fourth window). Heaton, Butler and Bayne, 1926 (ibid). 7. (South chapel, south window) F Spear (1965) (ibid). 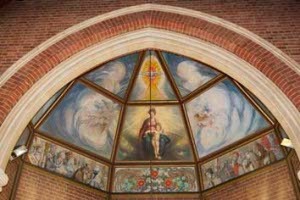 Paintings: (South chapel roof) Strongly derivative of Raphael, painted by Miss M Tongue (Church website) and dating from 1922. The altar table is similarly painted and is probably by the same hand. 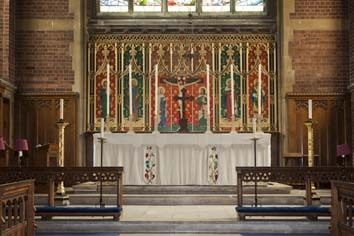 Reredos: Carved and painted and attributed to the Warham Guild (BE(E) p120).